Disclaimer: I did not pay for my meal, No. 8 by John Lawson hosted a free media dinner. The opinions reported below are based solely on my thoughts at the time of my visit. Yep, it’s happened: I’ve found the best bread in Melbourne. A potato, rosemary and honey sourdough, to be precise. I suggest heading to No. 8 by John Lawson (formally known as No. 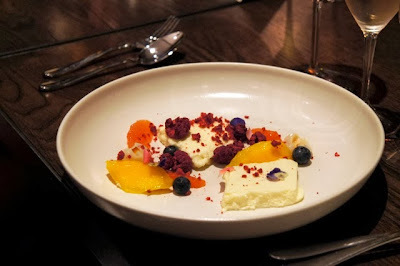 8, go figure) at Crown Casino if you want to taste it. Adjectives like ‘soft’ and ‘fluffy’ don’t cut it. Each bite was dense but not heavy and boasted attributes usually reserved for unicorns and rainbows. And just when I thought it couldn’t possibly taste any better, a thick smear of salty seaweed butter joined the party. 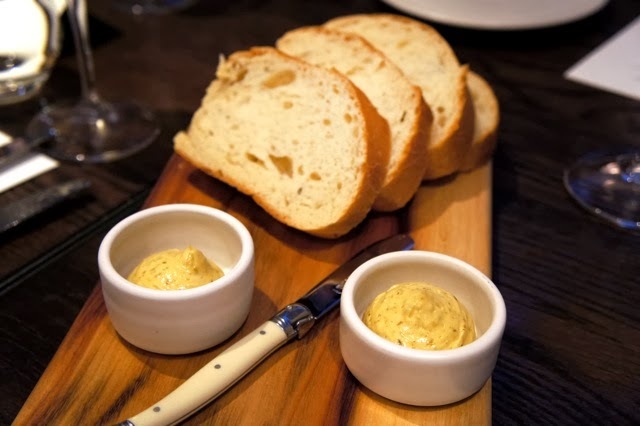 It’s not that Chef John Lawson’s dishes aren’t impressive – he’s one of the few who can still blab on about sourcing seasonal produce from Victorian farmers and get away with it – it’s just that the bread is THAT good. EDS Breads, an artisan bakery specialising in sourdough, makes it exclusively for him. But enough about the bread – of which I may or may not have devoured an entire loaf – let’s talk about the restaurant, perched on the Yarra River beneath the famous Crown fireballs that ignite every hour. After a decade, No. 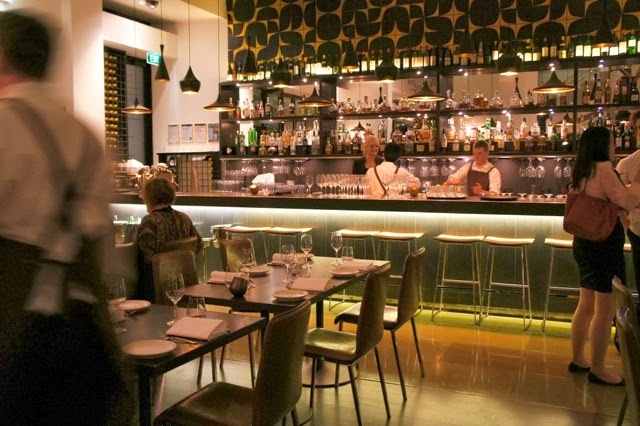 8 underwent minor refurbishment and major refinement. The fit with Lawson himself is evident – muted colours and licks of green reference nature and Lawson’s respect for produce. Even the earthenware is a little bit spesh, crafted by a local potter to complement the dishes. We pinched Lawson from London, when he arrived in Melbourne a few years ago to open Gordon Ramsay’s Maze restaurant. After that failed, Lawson went on to run Crown’s Mr. Hive. His obsession with locally harvested food has stuck to him like a shadow since his stint at La Rapiere in Bayeux, France, where he cooked with produce from local farms. 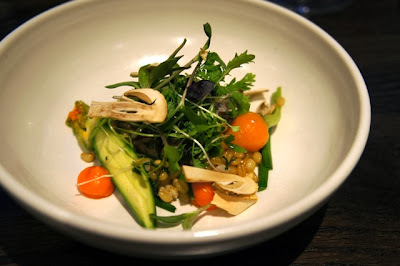 Nothing exemplified this obsession more than the Flowerdale Farm spring salad, with its freshly foraged appearance, chewy wheat berries (best described as ‘al dente barley’), blobs of baby carrot purée, thin zucchini slices and their flowers, sunflower shoots and almond mushrooms (another ingredient grown exclusively for Lawson, although I failed to pick up the marzipan aftertaste and truffle tones). 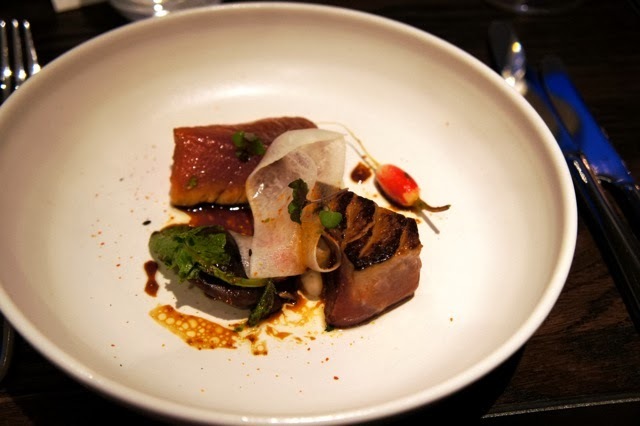 The highlight was the Portland black and blue tuna steak, sashimi-style in the centre and seared on one side. It arrived tangled with ribbons of daikon, beside baby radishes, and laced with sharp black garlic, yuzu jam and fermented aged soy. 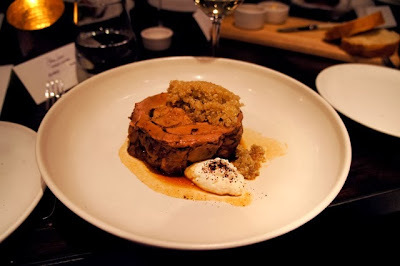 I ordered the Barwon River lamb shoulder, a serious hunk of tender meat cooked over 12 hours, speckled with bush spice quinoa and complemented with an unfortunately minute dollop of sheep’s yoghurt. Again, this little lamb is bred just for Johnny boy. 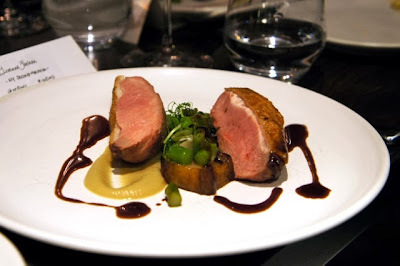 The other option was the Milawa duck breast, a cross of five different species available to everyone. Just kidding! It too is marked ‘Lawson only’. I attacked my fellow diners’ dishes and admittedly fell victim to food envy as I bit through the crispy skin into the juicy pink flesh. The sweet shallot purée and oh-so-seasonal asparagus and peas didn’t go astray, either. 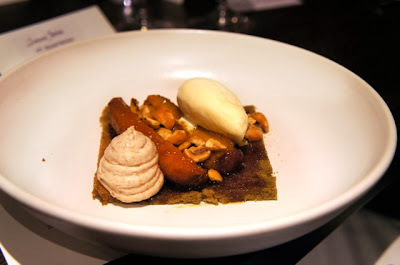 When it came to dessert, I was thrilled with Lawson’s contemporary take on banana split. Banana coated in rum caramel and scattered with toasted hazelnuts rested on a thin slice of banana bread. A piping of banana cream here, a quenelle of banana ice cream there, and it’s difficult to ever eat the version with chocolate sauce and hundreds and thousands again. 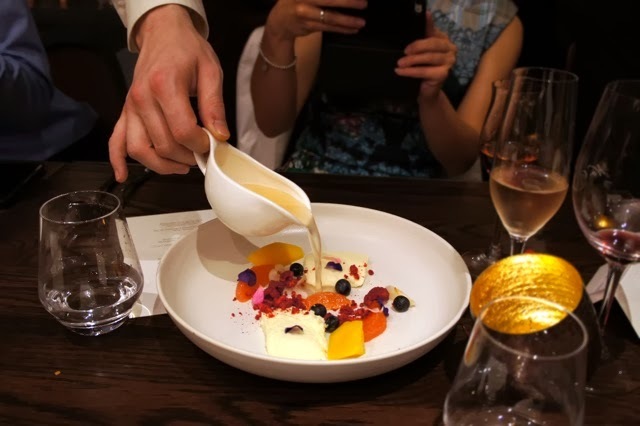 Those who missed out on the split were treated to a pretty spring garden of yoghurt and honey mousse interspersed with lychee, blueberries, mango, freeze-dried raspberries and edible flowers. If it were a dress, I’d have bought it. 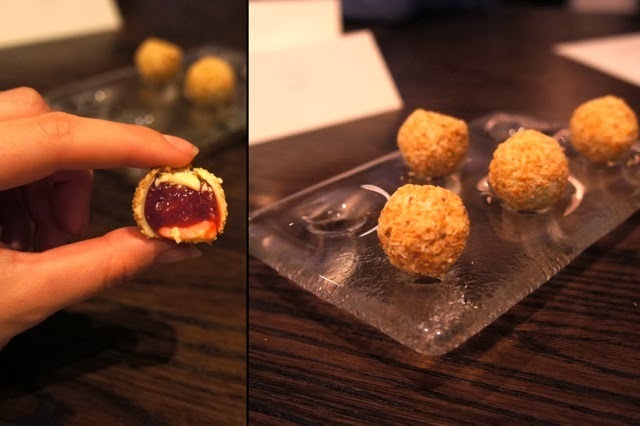 We finished up with petit four – thin white chocolate spheres coated in toasted coconut and filled with sticky strawberry jam. While the PR campaign can tout Lawson’s prior experience, exclusively raised meat, superbreeds of poultry and mushrooms posing as nuts, only one thing really matters: No. 8 by John Lawson offers a stunning menu that almost competes with its bread. Almost. For more information click here, or to book please call (03) 9292 5777. Hi Ed. What can I say? You did good. Really, really good. With the upcoming techniques and security proofed software you can have full trust on situs judi bola online casino. I really like all the discussions that you present for deeper study this forum and very helpful. Anda akan mendapatkan prediksi sepakbola terjitu yang bisa digunakan untuk bermain taruhan betting online di agen judi bola sbobet.